I guess everyone knows the story of how Jimmy Page killed the original release on Epic records one day after being released. I kinda understand his concerns - the producer screwed up royally by adding crowd noises, Keith Relf's vocals-probably not his best night. The recording possibly could have been done better. Plus the first Led Zeppelin album was about to be released. All that aside though, Jimmy Page and his guitar totally smoke on this. The combination of a Telecaster and Vox amps give a tone that at times is so sweet that even in Led Zeppelin's heyday Page never sounded better. Every song is great, every song totally rocks. The 12 minute version of of "I'm a Man" - Wow! I'm thrilled to get this as a legitimate release, I'm sure Page's legal team is already trying to stop distribution on this. Anyway this might be one of the greatest guitar albums ever - Page is young, hungry, and on top of his game here. This is the 2008 release from Lost Diamonds The two bonus tracks, I'm not sure where they come from, one guy on Amazon says the Olympia Theater in Paris, same year. Danke! Serendipity works! I had an RSS feed from you for ages, after using your blog, but lost it for one reason or another. Today I clicked on another totally unrelated blog (or so it seemed) and got back here. 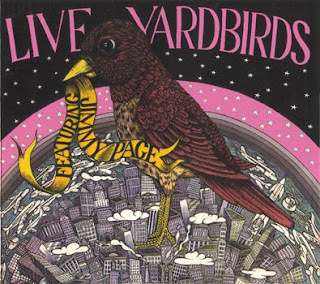 Can't thank you from RSS, so I'll thank you here for the Yardbirds. Keep it up my friend. HOW DO I GET THE FOUR PARTS TOGETHER? I unrar part1 ok, but 2 to 4 will not unrar. Hi anon @9:54 - all the parts are extracted through part 1. If you extract the files from part 1 and don't get any error messages you have the whole file.